This castle shows the distinctive Chambord Castle or 'Chateau de Chambord' of France built in 16th century around 1519 to 1575. This castle is distinctive because of its French Renaissance architecture showing features of French and Italian styles of architecture. Being the biggest chateau of the Loire valley, this castles was contructed for Francois I in order for him to be near his mistress Comtesse de Thoury, Claude de Rohan. The designer of this chateau is thought to be architect Philibert Delorme although Da Vinci was also suspected to be the designer of the original sketches. Here we see the northern facade of the castle with its green gardens and defended by a moat. The elaborate roofline with over ten types of towers and chimeneys in the central section is unique, as is the style of the chateau which includes a double helix staircase in the centre of the castle. These stairs rises without ever meeting to the roof illuminated by light from the peak from the top of the chateau. 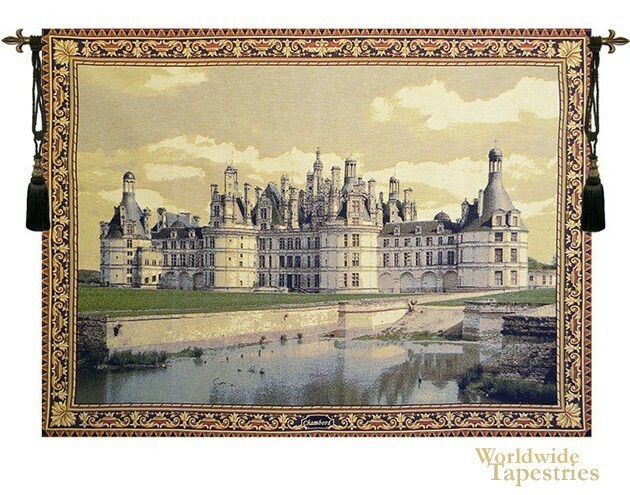 This castle tapestry is backed with a lining and has a tunnel for easy hanging. Note: tapestry rod and tassels, where pictured, are purchased separately. Dimensions: W 57" x H 38"
Dimensions: W 74" x H 57"